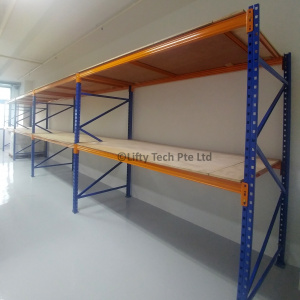 Pallet racking systems, for the space constraint Singapore, such as the “blue-orange” pallet rack system will increase your storage space easily by utilising the vertical real estate, resulting in an increase of your storage yield. We are a ONE-STOP solution for your warehouse storage solution. From Pallet Racking to lifting equipment. We have them all, we will be able to give you expert advise that will meet your needs. There are a few types of racking systems that can help increase your storage density. Modular shelf system allows you to store long items through the shelf within the rack! 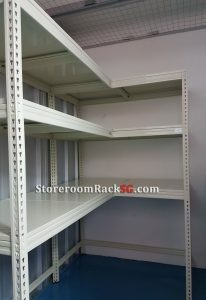 These boltless rack systems are meant for light duty (comparing with pallet racks). Depending on your requirement each shelf can be made to hold up to 400kg. With our unique shelving solution, you can choose between fibreboard or steel shelf decking. If you are running out of space in your home or storeroom it’s about time to look up. For more “scientific” explanation of pallet racking and its history you can refer to entry on pallet racks on wikipedia. Common lengths of pallet racking for 2 pallets side-by-side are at 2.7m long (excluding the vertical uprights). Typical racking system heights are at 3 or 4.5m. Please note that while your ceiling might be very high, adhering to local fire safety rules is necessary. Call us for a quick no obligation consultation on your heavy duty racking solutions. We take on racking jobs of any sizes. This customer requires just 1 row of racking. 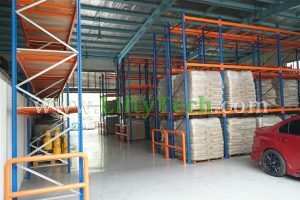 We provided him with the layout plan and virtual walkthrough of his pallet racking system. Needless to say, they were happy to have increased their storage space with our racking system. A cold room operates in sub zero temperatures, usually -22degC. This proves challenging for any inexperienced installers and the rack planners unfamiliar with the cold room environment. The customer was very happy that the pallet racking could be done up to their requirements within the cold room. 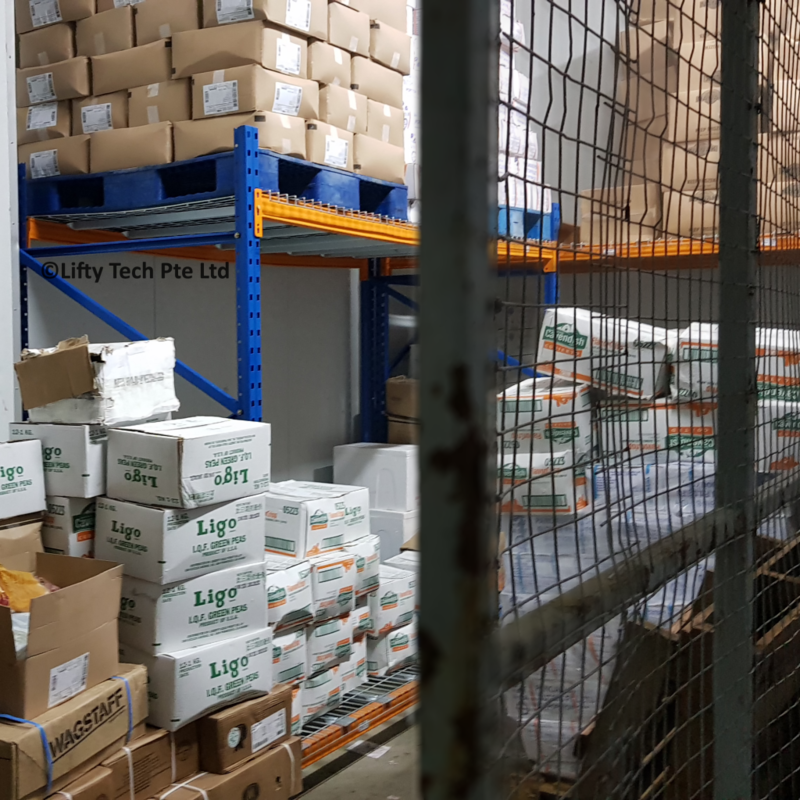 Located along Tampines Road, this fast growing local last mile fulfillment company needed more storage space to expand their operations. Our pallet racking system was the perfect solution for them. Our professional consultant did an on-site visit and optimised the layout for highest storage density possible. When you get a pallet rack, think also about how you are going to get your pallet or goods up and down from the pallet rack. One way is to have steps or trolley ladders and you can walk up to get your goods. Another way is to get a pallet stacker or reach truck to move your entire pallet down from the top rack. The equipment you’re going to use is important because you’ll want your pallet racking plan to be compatible with it. You won’t want to end up installing your pallet racks, to know that your equipment cannot move in to put the pallets on it. We’ve come across several of such situation a year, but we were called in too late to propose any cost effective solution. Pallet Racking Decreases Your Storage Costs. Save Money! You are already paying for the fixed floor area, by increasing the available space for you to store your goods, you are effectively reducing your storage costs. Pallet racks are ideal for this. Don’t be left behind in the competition because you have ran out of storage space. 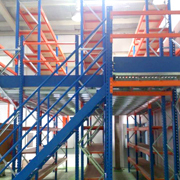 Multiply your floor space now with your pallet racking system from us. We have both pre-owned and new pallet racks for you to choose from. Unsure? Call us! Why Should You Get Heavy Duty Rack From Us? You need an expert to maximise the floor space for you, this, anyone can do with simple software. While it seems like a good idea to squeeze as much storage racking into the warehouse. You maybe surprised why it’ll cost you more. 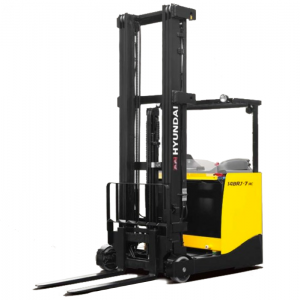 You need an expert with the pallet lifting equipment (such as a pallet stacker, reach truck, or forklift) to tell you how much space between the pallet racks you require to manoeuvre the equipment, because this is what they don’t tell you till you have built your rack and you start to regret it not planning ahead. It’s not their fault really! Since they are a racking specialist, not a warehousing expert! Sure, you can take the safe route and plan for an extra big aisle width, thereby, wasting your precious storage space! The main bottle neck is the manpower schedule to install the racking system because we are in Singapore after all! 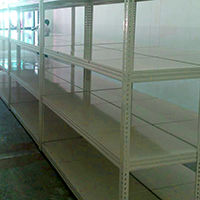 Notwithstanding, we will provide you the best pallet racking service, done up professionally. With no compromise to safety, so that you are proudly show your pristine racking system to guests and customers visiting, thereby earning you the trust and recognition in your field. We’re fast. 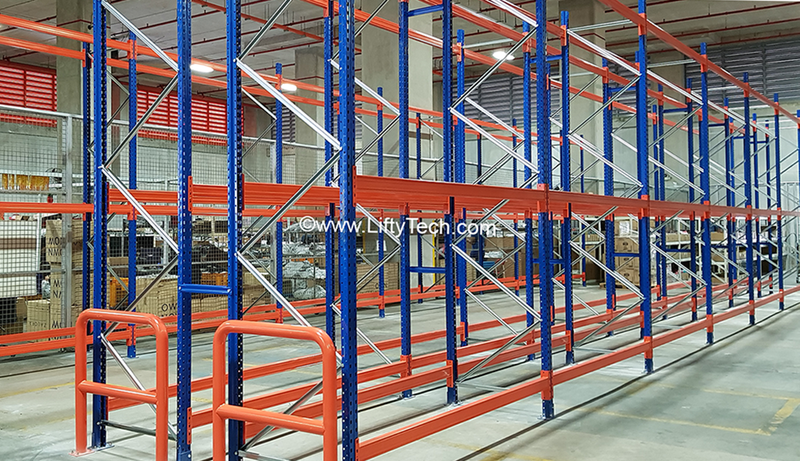 You should try calling us about your heavy duty racking requirements and see how fast we work because we are able to get your system racking up faster than the most of the other guys, consequently saving you precious time on your operations to get business. 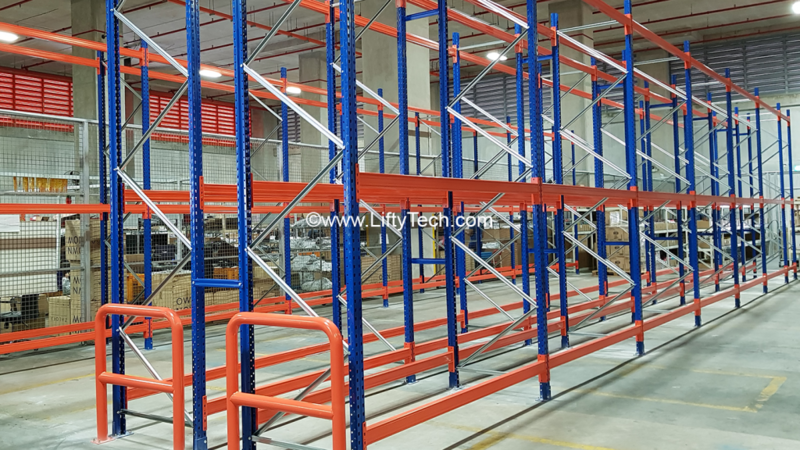 We manufacture our pallet racking for warehouse rack systems from South East Asia and reaches us in a matter of days, therefore so you can be assured that the racking quality is not compromised in exchange for price. Pallet Racking is the way to go, if you are thinking of scaling your business. Contact us for pallet racking now!